At some point in time, almost every kid gets a two-wheeler for the holidays. It&apos;s a gift that can keep on giving through spring, summer, fall and beyond, as long as you pay attention to a few key details that allow for an enjoyable ride. That’s where the experts—Pacific Cycle&apos;s Terry Collins, vice president of sales, and Joe Werwie, global director of product development—chime in. Follow their advice for finding the best bike and helmet for your teen or tween to pedal with pride. Size It RightMany parents opt for a larger ride, thinking their son or daughter will grow into it. The problem with that approach: Bikes become much more difficult to handle when they’re a size too big, and that can diminish a kid’s confidence on two wheels. Avoid this by heading to the bike shop knowing your child’s exact height. That way a pro can help you pick the ideal frame or you can base it on the retailer&apos;s sizing chart. Determine the TerrainThe second most important info you need before purchasing is where your child will ride. If he or she plans to pedal mostly on paved roads, a thinner tire is ideal, whereas a wider one works best on gravel or trails, since it'll have a better grip on rough surfaces. Also consider whether your kid will have to carry the bike up and down steps—a lighter model makes that much easier. Get Set UpBefore your child starts spinning, hold the front of the bike steady and have him or her sit on it. Crank the right pedal to its lowest position and make sure your kid's heel rests on it. If the knee is bent, raise the seat so that it's straight. If the foot doesn't touch the pedal, lower the saddle until the heel makes contact. The handlebars should be adjusted to a comfortable riding position that balances the pressure on your child's upper body and lower half. The rider's hands, arms, shoulders, back and neck should feel relaxed and natural. Find a good fitHelmet size is usually listed by age, but if you want an exact fit, it's best to bring your kid along to the store. (A helmet's tightness is most important for safety.) Most options will have a dial in the back for adjustments, so use that to ensure security. 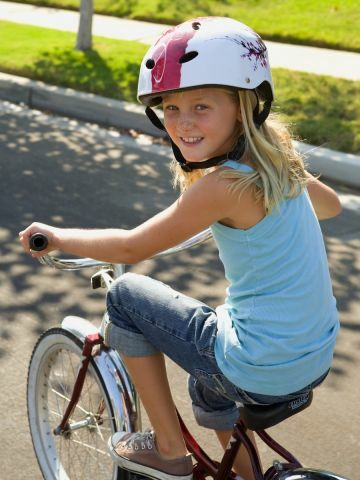 Kids can test the snugness by rocking their heads forward and backward—doing so shouldn’t shake the helmet. Or put your hands on top and try to move it front to back and side to side, and modify accordingly if it budges. Place properlyMany riders wear their helmets too far back on the head, with the front pointing upward, but it should really face straight forward. Aim for the front edge to be about one inch above the eyebrow. As for the straps, they should form a triangle around the ear, coming together below the earlobe. Tighten these so they’re directly under the chin and not swaying freely.